Companies and organizations that use forklifts know the overall effects of these motorized machines however, they may not realize the many benefits of a forklift wireless camera system. Forklifts play a critical role in ensuring that the activities in the production chain continue without any interruption. They transport goods to their required destinations faster and with ease. However, the operation of a forklift is more than just maneuvering in the warehouse. The operators and other parties involved have to put in lots of effort to ensure that there are no mishaps or accidents. The good news is that the operations can be made smoother and easier by a forklift wireless camera system. It is now possible to mount either one or two cameras with a screen (choose between a 7″ Screen or a 9″ Screen). The operator will be able to view everything around the forklift through the screen. Being wireless means that there is no physical connection between the cameras and the screen. The footage’s from the cameras are relayed directly to the screen in their raw form. Everything that appears on the screen is in real time. So, can this have any impact on a business? Yes, it does. Regardless of the size or nature of your business, the system will be of great help to forklift operators. Every business aims at maximizing its level of productivity. This can only happen if all the systems are in good condition. All the workers should be healthy (both physically and mentally), the machines should be in good condition among many other key issues. A forklift camera wireless system can help you achieve this goal. Obviously, this triggers the question of “How”. The operator will have a much clearer view of sight rather than a blind-spot. Understanding through visual observation, the proximity of their forklift to: other forklifts, pedestrians, and the other potential obstacles in their work area can definitely aid in the safe operation of a forklift. All of this will hopefully assist the forklift operator in the safe transporting of products and materials. Statistics on forklift accidents (http://winnipegsafetycompanies.com/wp-content/uploads/2016/12/Forklift-Accident-Statistics.pdf) are quite worrying. Did you know that the likelihood of a forklift to be involved in a fatal accident is 90%? According to statistics, forklift accidents result in approximately 85 deaths every year. Also, forklifts are associated with 61,800 minor injuries and 34,000 major injuries. The sad part is that 80% of these accidents involve pedestrians. Pedestrians can be crushed by a forklift, fall from the machine or get stuck. Of course, most of these accidents happen because the operator doesn’t have a clear view of the surrounding area. The material they are carrying may be too big such that it obstructs the operators view. A forklift wireless camera system is able to solve this problem. Forklift operators can move safely around the premises aided by cameras. They can also see if there is anyone who is in their line of travel and take life-saving measures. Overall, the cameras increase pedestrian safety by minimizing deaths and injuries that can be caused by a forklift. The victims of pedestrian accidents may be your employees, and such incidences can end up affecting their health and well-being. Products can get damaged when they are transported by forklifts. Although some may view this as a minor issue, it has far-fetching effects on the profitability of a business. Let’s assume that the product has passed through various stages of production, some of which are very expensive and complicated. Once the product is ready for shipping, it could get damaged by a forklift or while it is being transported on a forklift. Such an incidence will definitely force you to start the process all over again. Leading to added expenses and delays. A forklift wireless camera system will shield you from such damages. Apart from providing the operator a clear view of the path that they are supposed to take, theywill also be able to see the alignment of the product on the forklift. This will make them be extra cautious when maneuvering around. They will avoid risky situations that can damage the products as they will retain their original quality. 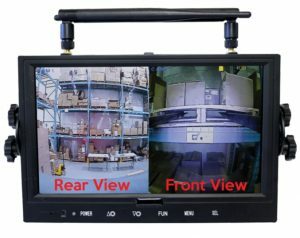 With the help of the camera system, a forklift operator will be able to identify and avoid possible safety issues that may be present in the inherent blind spots located around the forklift. This occurs when the camera is installed in places where, without the help of the wireless camera, their vision is obscured. One such example where this feature comes handy when the forklift is exiting a trailer or coming down a long aisle. Another location to consider camera placement is on the front of the forklift. The reason, is the limited visibility the operator has when as they navigate the forklift by looking through the mast. Depending on the style mast you have, for example a 3 stage or a 4 stage mast can greatly reduce the forklift operator line of sight. One way to increase the operators line of sight would be to mount a camera on the forklifts overhead guard. The video below helps illustrate the limited visibility a forklift operator has. 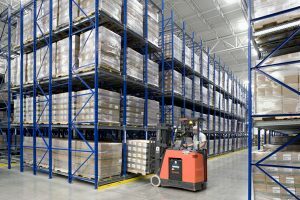 It is those warehousing and storage operations where inventory is stored high on racks that will definitely benefit from a wireless camera . The camera can be mounted at fork level which can assist your forklift operators with guiding the forklift tines into the pockets of the pallet. Reduce the chance of pushing pallets off racking, loosing products due to uneven lifting/fork placement or damaged product due to the forks coming into contact with them. It can also extremely helpful with label reading. Wireless cameras should be viewed as a tool that compliments proper forklift operator training and pedestrian training. It can’t be denied that having an ever-present worker boosts the productivity of a company. However, it should not be utilized for purposes that could lead to unsafe practices. When wireless cameras are installed on forklifts periodic observation of the operator is still essential as unsafe practices may develop. One of the behaviors to identify and be aware of is whether or not the operator is aware of his/her surroundings. Also, observe the sitting posture/visual awareness of the forklift drivers, are they looking 360 degrees around them, or are they only focused on what they see on the screen in front of them. Operators that rely only on what is shown on the screen in front of them are putting their life and those around them at risk. They need to always be aware of their surroundings. Now that we have seen the benefits that a business can enjoy from using a forklift wireless camera system, let’s look at what you should know about the camera. Do not be scared by the advanced features that the forklift wireless camera has. You can use it without having any technical background. It is easy to install and mount at various points of the forklift. Once ready, the cameras relay to the screen high-quality images that won’t leave you confused. The forklift wireless camera system can be easily mounted at various strategic points where they can provide a perfect field of view. These locations include the rear of the forklift, on an overhead guard, and on a carriage. You also have a choice between a 7″ Screen Kit and a 9″ Screen Kit. From this article, it is clear that there are lots of benefits that your business can get from a forklift camera system. Installing it will open your business for bright and profitable days ahead. I appreciate the content writer. It is pretty informative and helpful.